Each service begins with a facial steam bowl infused with a blend of herbs and essential oils tailored to the needs of your skin, body, and mind. Choose from a variety of garden goodies, such as uplifting rose petals, relaxing lavender buds and detoxifying berries and over 30 therapeutic grade Essential Oil. A purifying and hydrating treatment tailored to each client's skin type that promotes radiant and clear skin, through a double cleanse, steam, exfoliation, facial massage with nourishing serum, and a facial mask, followed by a protective moisturizer. 90 minute facial with neck, shoulder and foot massage/$120. This 65 minute facial is ideal for those suffering from Acne and break-out prone skin. Alpha Hydroxy Acid cleansers, Enzyme Masks, and an ultra calming and detoxifying mask, rich in anti-oxidants, anti-inflammatories and purifying charcoal will be applied. Extractions will be performed at the Estheticians discretion and clients consent in order to clear up existing pimples and blackheads. High Frequency electrodes will be used to help destroy bacteria post extraction. For those suffering from ongoing Acne and breakouts, it is recommended that this facial be done as a series of 3 or more, 1-2 weeks apart. 20% Discount for series of 3 or more. The perfect facial for hyper-pigmented skin (as a result of sun damage, scarring and hormonal changes) or to simply brighten dull skin. Get your glow back through a combination of a Vitamin C, Licorice Root and Lactic Acid enriched cleanser, serum, exfoliant and mask. Each of these active ingredients contributes to reducing redness or discoloration of the skin, resulting in a more even complexion. It is strongly recommended that prolonged and direct sun exposure be avoided for 48 hours post treatment and that an SPF be worn during the daytime. Increase collagen and elastin and effectively reduce fine lines, wrinkles, hyper-pigmentation, pore size, scarring and acne with this revolutionary skin enhancing procedure. Minimally invasive and relatively painless, you are likely to see noticeable results the same day. This facial begins with an AHA cleanser, a Vitamin C enriched enzyme mask and then a numbing cream is applied to the face to begin the Microneedling process, which is followed by a calming, anti-inflammatory mask. Most people do not experience redness or swelling post Microneedling procedure but in some cases it may take a couple of hours for the redness to subside. $125/ 90 minute facial with neck and shoulder massage. 20% Discount for Series of 3 or more. Experience the benefits of Microneedling/Collagen Induction Therapy in a 60 minute express facial. Includes Abura's Clay Cleansing Balm, followed by the Microneedling procedure (accompanied by a Hyaluronic Acid and Vitamin C Serum), Facial Massage, Steamed Matcha Mask application, and finished with the Calming Serum and Let's Face It Moisturizer. This Botanical Facial tailored to each clients skin type, includes a Deep Cleanse, Exfoliation, Steam, Microdermabrasion, Hydrating Rose Brightening Mask, Neck and Shoulder Massage, High Frequency Facial Muscle Stimulation and Extractions may be performed at the Esthetician’s discretion and client’s consent. ***If Microdermabrasion is not ideal for client's skin type, a variety of other facial options are available. Increase collagen and elastin and effectively reduce fine lines, wrinkles, hyper-pigmentation, pore size, scarring and acne with these revolutionary skin enhancing procedures. Minimally invasive and relatively painless, you are likely to see noticeable results the same day. A numbing cream is applied to the face to begin the process, which is followed by a calming, anti-inflammatory mask. Some people will experience mild redness or swelling post micro-needling procedure, which generally subsides by the next day. Nano-needling Therapy is very similar to micro-needling and both treatments address many of the same skincare concerns. Both treatments utilize a needling device that punctures the skin, which helps products fully absorb and encourages collagen production. The main difference is that nano-needling is done with silicone needle-like points and micro-needling uses actual micro needles. Micro-needling penetrates more deeply whereas nano-needling only reaches the upper layer of the epidermis. Micro-needling is preferred if your skincare concerns are deep acne scars, deep wrinkles, stretch marks and hyper-pigmentation. Nano-needling is preferred if you’re concerned about fine lines and wrinkles, sagging skin, swelling or dark areas. Add either on to any facial service! 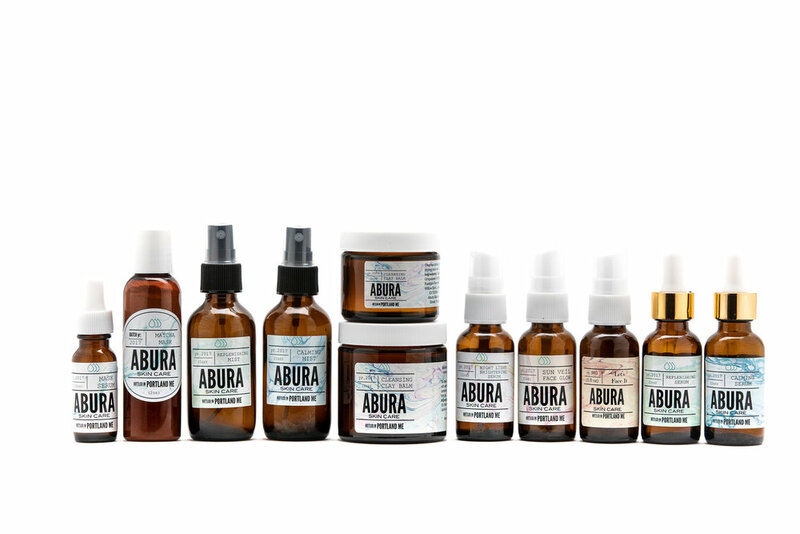 Veyda Rose features 100% Natural Products by Abura Skincare. A relaxing treatment that provides a deep cleanse aimed to detoxify, soften and tighten the skin on the shoulders and back. This back treatment begins with a steamed deep cleanse and manual exfoliation, followed by a Sweedish massage. The treatment is completed with a detoxifying Moore Mud mask, which promotes circulation, cleanses and leaves the skin feeling softer and smoother. For clients suffering from back break outs, extractions may be performed at the Estheticians discretion and clients consent or request. One of the most effective ways to draw impurities from the skin is through the application of masques rich in minerals, essential oils and detoxifying elements. This treatment begins with a full body exfoliation through dry brushing followed by the application of Moore Mud, which detoxifies, remineralizes and tightens the skin. Client receives a foot or scalp massage while the mud masque works it's magic on the skin and the service is finished off with the application of a detoxifying Essential Oil blend.